The 75-lb. heavy bag is one of the primary training tools for kickboxing, martial arts and boxing. Training with the heavy bag will help you throw effective combinations with kicks and punches. Hitting the heavy bag regularly will increase your endurance, timing and power and will also give you the kind of cardiovascular workout that will keep you sharp from start to finish in a kickboxing match. You will learn the best way to move around during the fight when you hit the bag. As you deliver punches and kicks, the bag will sway, much like your opponent will move as you throw punches. Effective kick boxers will throw punch-kick combinations and then move out of range. Then they will move back in, throw more combinations and get out of the way again. The heavy bag will help you with your timing of when to move in and when to move out. The kickboxer must develop his ability to attack with combinations. The combination workout will help you learn how to do this in a kickboxing match. Circle the bag to the left if you are right-handed. Go in the opposite direction if you are left-handed. Jab with your left hand, throw a front right kick and then a left hook. Follow with a left jab, a right roundhouse kick and a straight right cross. Finally, throw a left roundhouse kick, a right uppercut punch and a left crescent kick. Keep hitting the bag with these combinations for three minutes. Take a one-minute break and repeat the drill. Fighters in all disciplines quickly learn that throwing punches with just your arms will not be consistently effective. You have to use your whole body to throw effective power punches. Power starts with the legs, moves through the core muscles and must then move to the upper body, shoulder and fists. Hit the bag for three minutes at a time to mimic a round of boxing, alternating left- and right-hand punches. Take a one-minute break and repeat the set. Do not throw jabs -- this is for power punches only. Use the heavy bag to develop excellent technique with your roundhouse, front and crescent kicks. You will keep your opponent in a vulnerable position when you can deliver these kicks with power and authority. Most fighters will use their dominant leg for the majority of the kicks. However, you should alternate legs when you practice your kicks. Start off with three right roundhouse kicks, follow with three front kicks and then three crescent kicks. Then do the same with your left leg. Do three reps with each leg, take a one-minute break and then repeat the three sets to develop more consistency and power with your kicks. 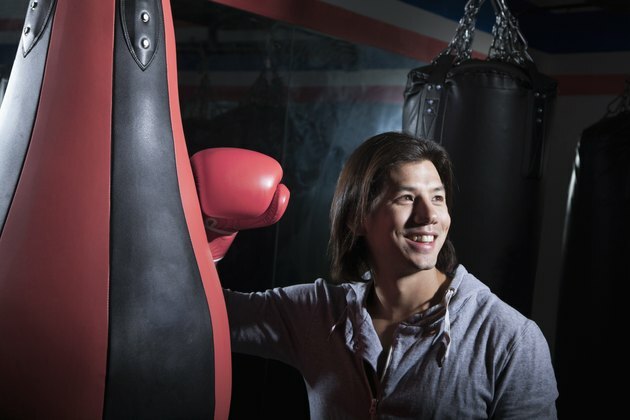 Does Hitting a Punching Bag Help Lose Weight?